Students from two schools in our London region met business leaders from a host of high-profile companies on 7th November to tell them about the real challenges facing young people, in particular young girls, today. The visit was part of our Seeing is Believing (SIB) events, first set up by our patron, HRH The Prince of Wales, in 1990. The visits aim to inspire and engage senior business leaders but also to raise their awareness of the issues facing young people in our most disadvantaged communities across the country. In the past 5 years alone, almost 3,000 business leaders have been a part of the unique visits. Pupils from Elizabeth Garrett Anderson Secondary School in North London and Thomas Buxton Primary School in East London, met senior figures from companies as diverse as: Lloyds Banking Group plc, Khalid Javid & Co, Capita Group, and Ford UK. Visit delegates also included Baroness Scotland QC, Lord Verjee and the Permanent Secretary of the Department of Education. During the visit the students spoke candidly about the challenges they have faced and how they overcome them. The visit leader, David Harris, Co-CEO of Hogan Lovells International LLP, is also leading Hogan Lovell’s participation in BITC’s Business Class campaign and has been actively involved with our Apax-Mosaic Enterprise Challenge. 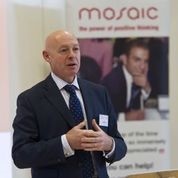 After the Seeing Is Believing event, Mosaic will continue to work with delegates to see how they can get involved. A report of the visit, with submissions from the delegates is sent to our Patron The Prince of Wales who reviews the outcomes on an annual basis.